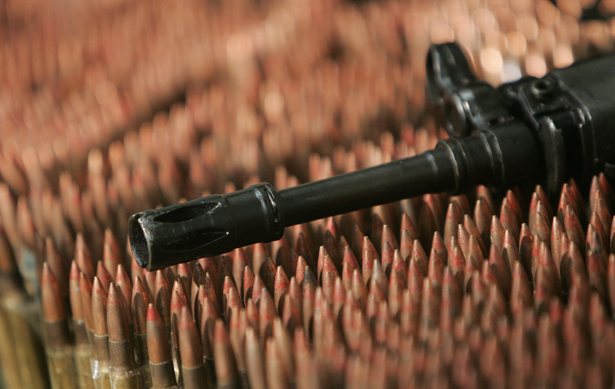 Are Washington, Moscow and Beijing using the global arms trade to create a new cold war? Did Washington just give Israel the green light for a future attack on Iran via an arms deal? Did Russia just signal its further support for Bashar al-Assad’s Syrian regime via an arms deal? Are the Russians, the Chinese and the Americans all heightening regional tensions in Asia via arms deals? Is it possible that we’re witnessing the beginnings of a new cold war in two key regions of the planet—and that the harbingers of this unnerving development are arms deals? International weapons sales have proved to be a thriving global business in economically tough times. According to the Congressional Research Service (CRS), such sales reached an impressive $85 billion in 2011, nearly double the figure for 2010. This surge in military spending reflected efforts by major Middle Eastern powers to bolster their armories with modern jets, tanks and missiles—a process constantly encouraged by the leading arms manufacturing countries (especially the United States and Russia) as it helps keep domestic production lines humming. However, this familiar if always troubling pattern may soon be overshadowed by a more ominous development in the global arms trade: the revival of far more targeted Cold War–style weapons sales aimed at undermining rivals and destabilizing regional power balances. The result, inevitably, will be a more precarious world. Arms sales have always served multiple functions. Valuable trade commodities, weapons can prove immensely lucrative for companies that specialize in making such products. Between 2008 and 2011, for example, US firms sold $146 billion worth of military hardware to foreign countries, according to the latest CRS figures. Crucially, such sales help ensure that domestic production lines remain profitable even when government acquisitions slow down at home. But arms sales have also served as valuable tools of foreign policy—as enticements for the formation of alliances, expressions of ongoing support and a way to lure new allies over to one’s side. Powerful nations, seeking additional allies, use such sales to win the allegiance of weaker states; weaker states, seeking to bolster their defenses, look to arms deals as a way to build ties with stronger countries, or even to play one suitor off another in pursuit of the most sophisticated arms available. In those years, the Americans and the Soviets also used arms transfers to bolster key allies in areas of strategic confrontation like the Middle East. Washington armed Israel, Saudi Arabia and Iran when it was still ruled by the Shah; Russia armed Iraq and Syria. These transfers played a critical role in Cold War diplomacy and sometimes helped tilt the scales in favor of decisions to go to war. In the Yom Kippur War of 1973, for example, Egypt, emboldened by an expanded arsenal of Soviet antitank missiles, attacked Israeli forces in the Negev desert. In the wake of the Cold War and the collapse of the Soviet Union, however, the commercial aspect of arms sales came to the fore. Both Washington and Moscow were, by then, far more interested in keeping their military production lines running than in jousting for advantage abroad, so emphasis was placed on scoring contracts from those with the means to pay—mainly the major oil producers of the Middle East and Latin America and the economically expansive “tigers” of Asia. Between 2008 and 2011, the CRS ranked the leading purchasers of conventional arms in the developing world this way: Saudi Arabia, India, the United Arab Emirates, Brazil, Egypt and Venezuela. Together, these six countries ordered $117 billion in new weaponry. * In April, during a visit to Jerusalem, Secretary of Defense Chuck Hagel announced a multibillion-dollar arms package for Israel. Although its final details are still being worked out, it is expected to include V-22 “Osprey” tilt-rotor transport planes, KC-135 aerial refueling aircraft and advanced radars and anti-radiation missiles for Israel’s strike aircraft. “We are committed to providing Israel with whatever support is necessary for Israel to maintain military superiority over any state or coalition of states and non-state actors [in the region],” Hagel told reporters when announcing the package. The United States has, of course, long been committed to Israel’s military superiority, so there was something ritualistic about much of Hagel’s performance in Jerusalem. No less predictable were the complaints from Israeli military and intelligence sources that the package didn’t include enough new arms to satisfy Israel’s needs, or were of the wrong kind. The V-22 Osprey, for example, was proclaimed by some to be of marginal military value. Far more surprising was that no red flags went up in the media over what was included. At least two of the items—the KC-135 refueling planes and the anti-radiation missiles (crucial weaponry for disabling an enemy’s air-defense radar system)—could only be intended for one purpose: bolstering Israel’s capacity to conduct a sustained air campaign against Iranian nuclear facilities, should it decide to do so. At present, the biggest military obstacles to such an attack are that country’s inability to completely cripple Iranian anti-aircraft defense systems and mount sustained long-range airstrikes. The missiles and the mid-air refueling capability will go a long way toward eliminating such impediments. Although it may take up to a year for all this new hardware to be delivered and come online, the package can only be read as a green light from Washington for Israel to undertake preparations for an attack on Iran, which has long been shielded from tougher UN sanctions by China and Russia. For anyone who has followed Asian security affairs over the past few years, it is hard to view this deal as anything but a reaction to the Obama administration’s new Asian strategy, its “pivot” to the Pacific. As announced by President Obama in a speech before the Australian Parliament in November 2011, it involves beefing-up the already strong US air and naval presence in the western Pacific—in, that is, waters off of China—along with increased US arms aid to American allies like Indonesia, Japan, the Philippines and South Korea. Not surprisingly, China has responded by bolstering its own naval capabilities, announcing plans for the acquisition of a second aircraft carrier (its first began operational testing in late 2012) and the procurement of advanced arms from Russia to fill gaps in its defense structure. This, in turn, is bound to increase the pressure on Washington from Japan, Taiwan and other allies to provide yet more weaponry, triggering a classic Cold War–style arms race in the region. These are just some examples of recent arms deals (or ones under discussion) that suggest a fresh willingness on the part of the major powers to use weapons transfers as instruments of geopolitical intrusion and competition. The reappearance of such behavior suggests a troubling resurgence of Cold War–like rivalries. Even if senior leaders in Washington, Moscow and Beijing are not talking about resurrecting some twenty-first-century version of the Cold War, anyone with a sense of history can see that they are headed down a grim, well-trodden path toward crisis and confrontation. This may be the hope, but such expectations will quickly be crushed if the major weapons suppliers, led by the United States and Russia, once again come to see arms sales as the tool of choice to gain geopolitical advantage in areas of strategic importance. Far from bringing peace and stability—as the proponents of such transactions invariably claim—each new arms deal now holds the possibility of taking us another step closer to a new cold war with all the heightened risks of regional friction and conflict that entails. Are we, in fact, seeing a mindless new example of the old saw that those who don’t learn from history are destined to repeat it? What did it take for the UN arms treaty to pass? Read Catherine Defontaine’s report.